WASHINGTON — White Americans by large numbers disapprove of athletes protesting during the playing of “The Star-Spangled Banner,” according to a new poll. Black Americans approve of the protests by even wider margins. 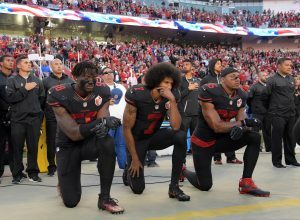 Some athletes have been refusing to stand during the national anthem as a protest of the treatment of blacks by police. The Quinnipiac University poll showed that the younger the person, the more likely he or she is to approve of athletes not standing or taking a knee. The poll, released this week, showed that white Americans of all ages disapprove of the protests by a margin of 63 percent to 30 percent. Hispanic Americans disapprove of the protests by a smaller margin, 45 percent to 36 percent. However, black Americans of all ages approve of the protests 74 percent to 17 percent. “There is a profound racial divide over athletes who refuse to stand for the national anthem,” said Tim Malloy, assistant director of the Quinnipiac University Poll. Athletes around the country have been either kneeling or sitting during the national anthem to call attention to what they perceive to be police brutality and racial discrimination in the wake of black men being shot by police in various parts of the country. San Francisco 49ers quarterback Colin Kaepernick popularized the recent spate of protests. Overall, more than half of Americans — 54 percent — disapprove of the protests while only 38 percent approve. But there was a large generational difference in approval of the protests as well, with the older the person, the less likely he or she was to agree with the protests. The only age group to agree with the athletes protesting was the millennial age group, which in the poll was identified as 18-35. More than half of the millennials — 52 percent — said they approved of the athletes’ protests, while 37 percent disapproved. Americans age 35-49 disapproved at 54 percent, those 50-64 disapproved at 60 percent, and those over 65 disapproved at 70 percent. The Quinnipiac University poll surveyed 1,391 adults nationwide Oct. 7-9 with a margin of error of plus or minus 2.6 percentage points. READ MORE: Can schools punish students for protesting the national anthem?